Every year, the Iditarod Sled Dog Race starts in Alaska. 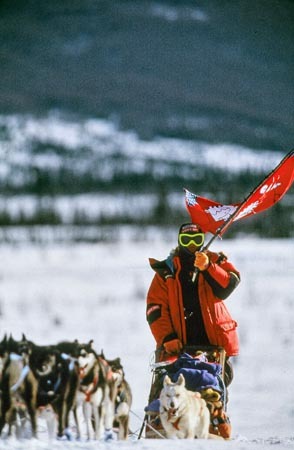 The Iditarod started 1973, and occurs between Anchorage and Nome. Sixteen Husky dogs and their mushers travel 1,049 miles of the roughest, most beautiful terrain of Mother Nature's creation . Adventurer Keizo Funatsu participated in the race. His friends presented him with a cheering flag to support him. I made a flag that glows in the snow so that friends can cheer him on as he passes by. Mr. Funatsu, 1993 winner of the rookie of the year along with Jason Barron, told me that listening to the sound of the flag flapping was encouragement that helped him overcome the 10 days of fighting with loneliness. When the flag returned to Japan with him, it was bleached by the cold and wind to a color like warm human skin.